The mysteries of the Egyptian pyramids are still being unravelled to this day, and here's your chance to discover just what riches might be lying within. 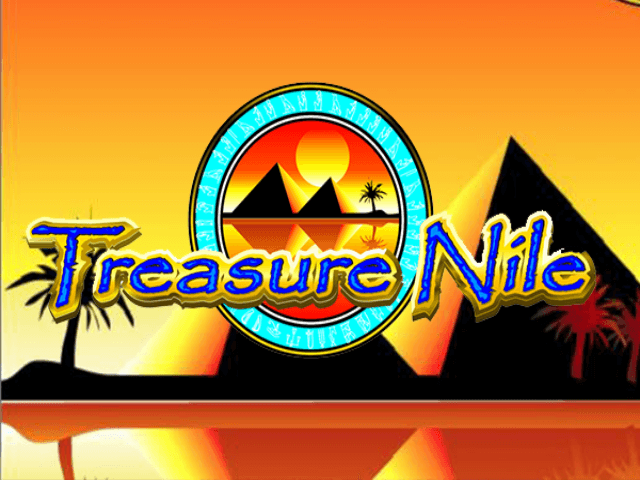 In this case, one of them is a progressive jackpot, which means this Treasure Nile slot from Microgaming has been appropriately named. There are no distractions from characters or convoluted story lines here – just pure pokie goodness. 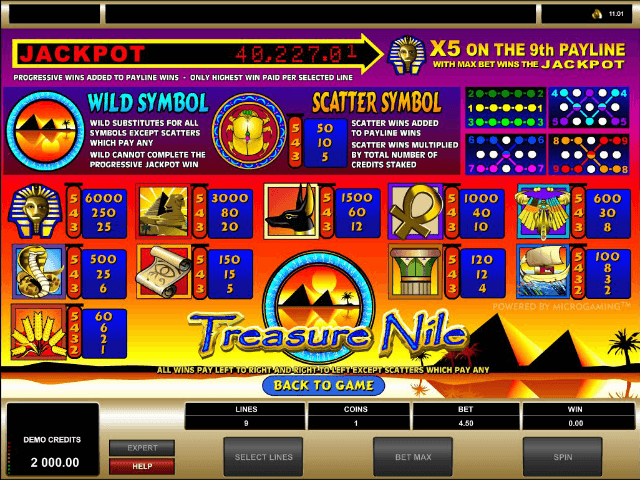 You'll play along five reels with a chance of activating up to nine paylines as you play. More on this later. The Egyptian theme only goes as far as the symbols themselves, which are very detailed and varied. While this is great, it might have been more immersive if Microgaming had extended the visual style to the backdrop – which is a rather garish purple. The information screen before you play is nice though, and features an Egyptian sunset with the pyramids in the background. While it might not be the flashiest when it comes to design and interface, nothing is confusing. You can clearly see what is what on the information bar along the bottom of the screen, and there are no animated distractions, which you might find to be a good thing. One thing that really sets this slot apart from other games is the simplicity of it. 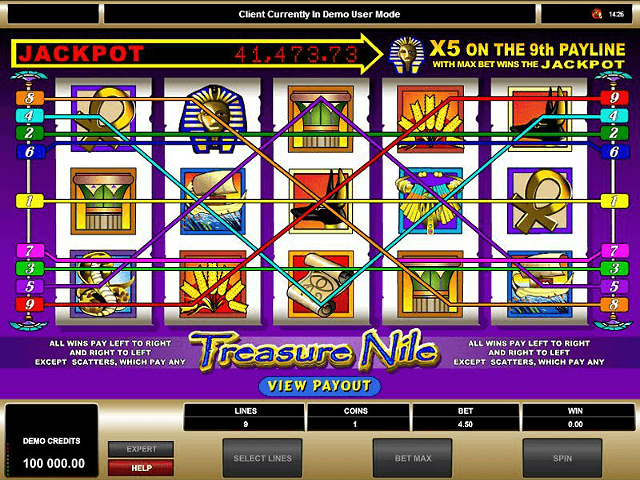 There are no Treasure Nile bonuses to think about (which might be good or bad, depending how complicated you like your slots to be), it's just straightforward spins all the way. We'll look at the special symbols later, but generally everything is as you might expect. Pharaohs are the highest-paying standard symbol. 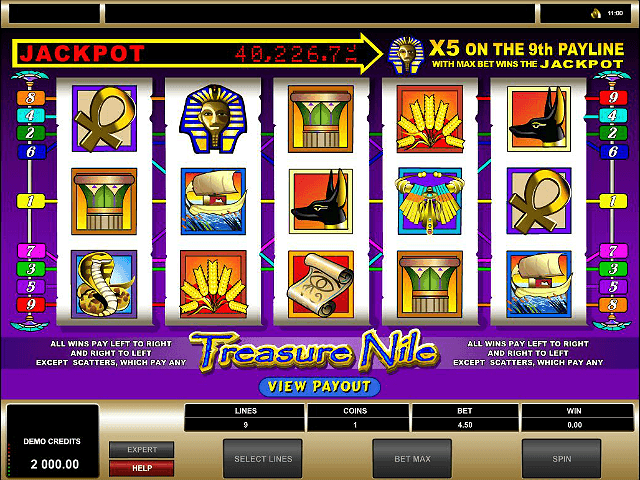 Get five lined up and you can take home a Pharaoh's share of the winnings – 6,000 coins. There's a progressive jackpot too, which can land you a huge win. More on that below. Although there aren't any bonus modes, you still need to keep an eye out for the special symbols. The pyramids themselves make the wilds, and the scatter symbol is represented by a scarab. If you can get five of these, you'll win a small payout of 50 coins. If you want to be in with a chance of winning the massive progressive jackpot, then be aware that you'll need to go all in with the max bet per spin. You can't adjust your coin size in this game either, so it's an all-or-nothing approach – not necessarily a bad thing. The max bet also activates all the paylines, so you'll be in a better position for winning in general. If you do get lucky, and match all five of the Egyptian faces, then the potentially life-changing progressive is all yours. And you'll probably have solved the mysteries of the pyramids too, but that might be the first thing on your mind if you’ve won that jackpot. In summary, this is an older slot, but it's a solid choice for high-risk/reward-style play if that's your bag. 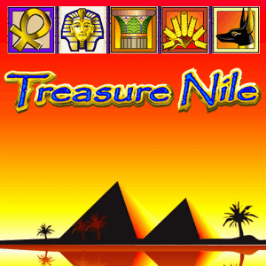 If you like Treasure Nile - You'll like these slots too!